Four shaft gear couplings driven four roll inverted L Type Calender. 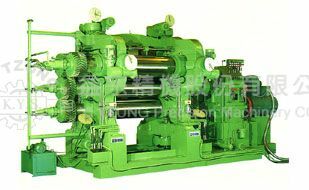 The main use of Calender is to press the mixed and refinded rubber mixture or many kinds of plastic mixture into uniform-thickness of films, sheets, and plates. Also, it can be applied to rubber or plastic sheets in single or double sticking or topping operation with textile fabricas. 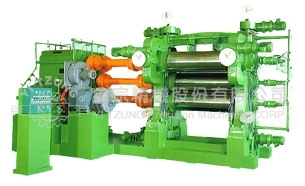 Besides, in the procession of sheeting, the machine can also press out the air in the material for producing the products without air bubble after cure. The more quantity of rolls the calendar has, the more times of the sheets are pressed and the calendar can make high quality and even thickness of sheets. This is an four shaft gear coupling driven four roll inverted L type calendar. It applies to tire topping or friction and the manufacture of ball tubes and shoes. The operation of such durable and exquisite calendar equipment is very simple and can get high effects. Common bed plate for roll inverted L type calendar The main use of Calender is to press the mixed and refinded rubber mixture or many kinds of plastic mixture into uniform-thickness of films, sheets, and plates. Also, it can be applied to rubber or plastic sheets in single or double sticking operation with textile fabrics. Besides, in the procession of sheeting, the machine can also press out the air in the material for producing the products without air bubble after cure. The more quantity of rolls the calendar has, the more times of the sheet are pressed and the calendar can make high quality and even thickness of sheets. This is an common bed plate four roll inverted L type calendar. It applies to tie sticking, and the manufacture of ball tubes and shoes. The operation of such durable and exquisite calendar equipment is very simple and can get high effects.